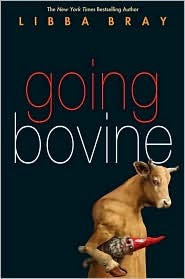 Going Bovine by Libba Bray is absolutely incredible. Seriously one of the funniest and most heart-felt books I've ever read. It's emotional and intelligent and just down-right weird. Before I started, I'd mentioned to a few people that I felt slightly intimidated to start a book that some had found confusing and the advice I was given was to 'just go with the crazy' - so that's what I did. And I'm kicking myself now for waiting so long to get this one. This book is worth buying and reading IMMEDIATELY. I can't stress that enough. At the start, Cameron didn't come off as a very sympathetic character. He's a teenage boy who doesn't really have any ambitions, he doesn't seem to care about much and he mostly lazes about doing as little as possible. But I definitely believed in his character. It felt realistic, Cameron's attitude towards his surroundings and the people around him in general. Plus Libba Bray is so funny and sarcastic and the observations on life that stream out of Cameron's head make me incredibly jealous of Libba Bray's writing skill. So it didn't take long at all before I really felt for Cameron and really felt emotionally invested in his story and his journey. This is such a strange story, really reminiscent of Don Quixote. Because when Cameron is diagnosed with a terminal disease (Mad Cow! ), he goes off on this crazy road trip because Cameron is visited by a punk rocker angel, Dulcie, and told that if he goes off to find a mysterious Dr X, that he will be cured. Is she a hallucination? What about his travel-mates, the talking yard gnome who is really a Norse god in search of his mythical ship? Or the video gaming hypochondriac dwarf with attachment issues with his mother? What I love so much, is amidst the humour and the wackiness of this story and the sheer fun of their adventurous road trip with all its mishaps, there is so much that pulls so much at my heart-strings. The transformation of Cameron from uncaring and distant from his life, into someone with friends and appreciates music and small moments and who falls in love is absolutely heart-breaking knowing that he is so close to death. I really loved the layers to this story, the way in which all aspects of Cameron's life are added into the narrative, from his mother's interest in Norse mytholgy, to snow globes and Coyote and The Roadrunner. There's time travel and jazz music, and it all just fit together so beautifully. I love how Libba Bray's pokes a little fun at society as well as giving us a cracking good story, one that made me think and question and most importantly a book that really made me FEEL. Going Bovine will stay with me for a very, very long time. I've seen lots of people saying good stuff about this, sounds like a great read. I've been wanting to read this for ages but have avoided it because I have absolutely no idea what it's about :P. But I think I could "go with the crazy" and give it a try - it definitely sounds hilarious! Haha! This sounds so funny! I'm still not entirely sure what it's about though... It sounds quite eccentric and...random! Jenni - It really, really is! You must read it. Fantastic, fantastic book. Liz - It's SO WORTH IT. Really, really. Read it.